Oh I can just smell this filling up our home on Christmas Eve… or any other special occasion, like Saturday night ;). What I love so much about this recipe is that you use puff pastry instead of pie dough. Puff pastry is just so light and flaky – melting in your mouth already! Catalina adapts the Pioneer Woman’s recipe, using Granny Smith apples, I totally agree on this as they have the perfect texture for pies and tarts. I can’t wait to try this one! 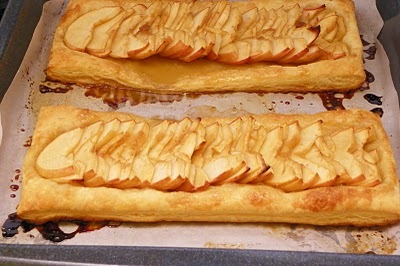 This entry was posted in food & entertaining and tagged apple tart recipe on December 4, 2013 by Presley-Love.